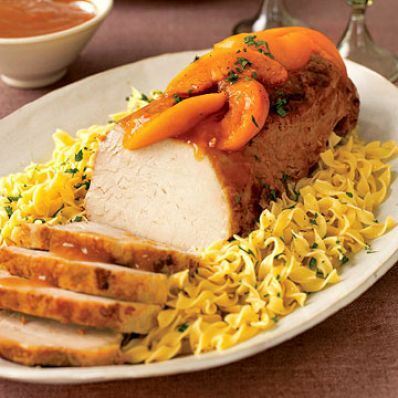 This impressive pork loin roast, garnished with spiced peaches and served with a sweet and tangy sauce, is surprisingly easy to make in your slow cooker. Plus, the meat is always moist and flavorful. 1 of 5 Coat a 6-quart slow cooker with nonstick cooking spray. Place roast into slow cooker; season with onion salt and black pepper. 2 of 5 Drain peaches, reserving the syrup. In a bowl, whisk syrup, chili sauce, brown sugar, vinegar and pumpkin pie spice. Pour over meat; scatter peach slices over the roast. 3 of 5 Cook 3 hours on high or 6 hours on low. 4 of 5 Remove meat and allow to rest for 10 minutes. Spoon out peach slices and reserve. Place liquid in a small saucepan and bring to a boil over medium-high heat. Stir in cornstarch mixture and cook, stirring, for about 30 seconds until sauce thickens. 5 of 5 To serve, slice meat and scatter reserved peach slices over the top. Serve with sauce on the side and egg noodles, if desired.